USB video capture is gathering more attention lately with AverMedia, Elgato and Hauppauge all updating their console recorders aimed squarely at gamers. This is a sizable niche market as more people flood YouTube with their gaming feats and video walkthroughs. 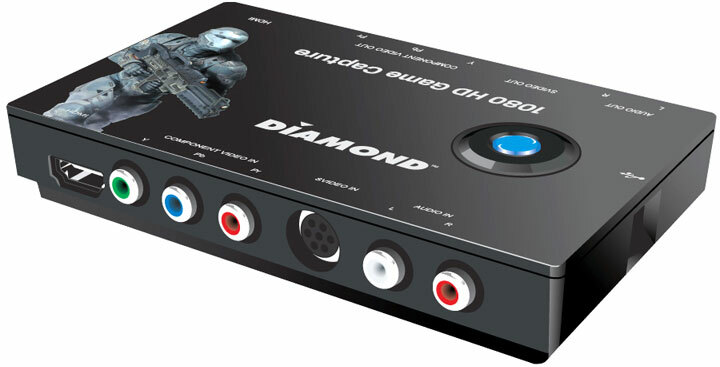 Today, Diamond is jumping onto the bandwagon with its Game Capture 1000 (GC1000). The GC1000, like others that come before it, is able to record digital (i.e. HDMI) or analog source (i.e. component, S-video) at maximum 1080i. XBox 360, PS3 and iPad gamers will indeed pick HDMI for optimal image quality while Wii owners can opt for the component. Pass-through is provided so you can play the game on the TV and let the GC1000 record the footage simultaneously. But most importantly, Diamond claims you won’t see any lag. Video going through the GC1000 is compressed via the on-board H.264 processor but the same chipset won’t be able to bypass HDCP so you are are stuck with 1080i30 HDMI on XBox 360 and component video on PS3. For HTPC fans, the USB 2.0 Diamond Game Capture 1000 doesn’t ship with TV schedule software so you are on your own if you want the GC1000 to double as a high-def PVR. At 139.99, the Diamond is more affordable than the Elgato Game Capture HD though the latter is praised for its superb Mac support and footage editing tools.